If I take off my financial advisor hat for a moment, I have to admit I wouldn’t want to be an investor choosing an advisor today. Unlike choosing a dentist or a doctor based primarily on geographic location, it’s hard to figure out how to make the right choice. The difficulty in choosing the right financial advisor starts with navigating the numerous and varied titles, qualifications and companies who give personal financial advice in Canada. Here are some of the titles out there: banker, broker, stockbroker, financial advisor, financial planner, investment advisor, account executive, registered representative and fee-only planner – to name just a few. Not very reassuring coming directly from the people in the financial advice industry. So how does an investor go about choosing the right advisor? What obligation or legal duty does this financial advisor have to put my interests first? It only makes sense that anyone giving financial advice, whether they work for a mutual fund dealer, insurance company, Big Bank Brokerage firm, independent brokerage firm or working in a bank branch should put your interests first. In fact, a recent article by Brad Steiman of Dimensional Fund Advisors pointed out that 70% of investors do actually believe that their advisor has a fiduciary (i.e. legal) duty to put their interests ahead of their own. Unfortunately, not all regulators share this belief. There is an old saying that “compensation drives behaviour” and if advisors need not consider costs to the client, what is stopping them from recommending products that maximize their compensation? Investors need to ask this question more often. The good news is that Portfolio Managers do have a fiduciary duty to act with care, honesty and good faith, always in the best interest of their clients. Investment decisions therefore must be independent, free of bias and costs to the client must be considered. If a picture is worth a 1000 words, then a stop action video must be worth a million. 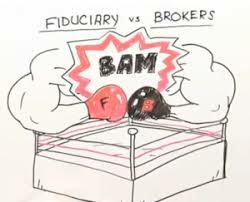 The following 2 minute video does an excellent job of addressing the differences between a “broker” and “fiduciary”.